A software update is now available that introduces new features and adjustments to enhance the overall experience. The software version after this update will be 1.0.1. 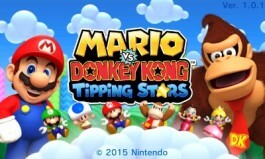 Please note: this update is required in order to use Mario vs. Donkey Kong: Tipping Stars' online features. Important: You will be able to continue using your saved game data.